We will be leaving in about 30 mins. Hopefully the boys will nap most of the way, it's a 4hr trip. I won't be on much probably cuz we'll be out doing stuff and at my inlaws they only have dial-up. So I hope you all have a great weekend! Today we are driving up to Idaho. We will be staying with Hubby's family until Sunday. Tomorrow we are signing the papers for closing on our old house, the Hubby's cousin is getting married. We probably won't be able to make it to the wedding, but we are going to the lunch and reception later. Then we will be going to church with them Sunday before driving back. Should be a fun weekend, and hopefully we will stop and see Michelle for a bit while we are up there. Share a beauty or grooming trick or tip with us. What does the color yellow make you think of? - LOL, honestly the first thing that came to mind is urine. Of course I've been working on potty training Jason, so it's on my mind more than normal. If you were to make your living as a photographer, what subject would your pictures revolve around? - Babies because they are just so adorable. What was the longest book you ever read? - Hm, I've read hundreds of books, so I can't remember what the longest one was. I know I've read ones that are 1000+ pages before, but can't remember what they were. Today I am thankful that my cold is starting to go away, though I still have a yucky cough. I am thankful for cough drops lol. And I am thankful that things worked out that we will be able to move into our new house on the 10th like we wanted (as long as my dad is in town with his moving truck). Yep, still sick :P But I think I'm getting a little better. Unfortunately my mom got it from me so she's sick now too. Not much planned for today. Nothing, really. Maybe I'll take the boys to the mall to play later. I need to do preschool with Jason, we forgot completely last week and didn't do it. Other than that it's going to be just a normal boring day. But the sun is shining and it should be in the 40's today, so that is a good thing. Well, we just found out our move-in date for our new house is a few days later than we thought it would be. Instead of hoping to move in the 10th, the earliest we can move in is the 12th, though it's more likely to be the 13th or 14th. Sigh. Oh well, that's still just over 2 weeks away so not that long. I'm pretty sure a few extra days won't kill me. I just don't want to have it be the 14th, cuz we are going up to Idaho for a wedding on the 15th and I was planning to leave the 14th to go. I guess we'll just have to see what happens. I'm even sicker today :P I really really hate being sick! I was up most of the night with a horrible headache, plus I was woken up a few times by Jakey, so I'm exhausted. Hopefully I can get a nap soon when I try to get Jakey to nap. We went to the mall to play again this morning, but we only stayed about 30mins because I was just too worn out. Not much else to do today, so that's good. Just taking care of the kids. I am getting so tired of all the paperwork that needs to be done when buying and selling houses. And we haven't even closed yet! There are addendums and disclosures and who knows what else. Then when we close I know there is a huge stack of papers to sign and initial and date. It takes forever and cramps up your hand from all the signing. Sigh. It's worth it though. Well, I'm still sick and my throat is just killing me. I went and bought some cold medicine and cough drops a little bit ago and that seems to be helping a little. I really hate being sick. But at least I got a nap today. I also took the boys to the mall and Arctic Circle so they could get out and play for a bit. Not much else going on here, just a normal day. Do you ever wonder how people come up with search terms. Like when you check out your blog's past info on what people have searched to get there, or on sites where you can see popular searches, and there are things like movers New York, hair all over cat, black clothes dress shop, etc. You know what I mean. Like the person has tried to narrow down the search by just putting in a few words, instead of a whole though. I do that I guess, like if I'm looking for a book but can't remember the whole title or author I might put in "sparrow mary" to find the author's full name (I actually did that exact search a few days ago. I just think it's funny how many parts of thoughts are searched for instead of whole ones lol. Ugh, I have a sore throat and it's driving me nuts. It started yesterday and was twice as bad today. I just hope it's not twice as bad tomorrow. It's like the dry, tickly kind that makes you want to cough all the time. I really need to go pick up some cough drops. Hopefully it will just be a sore throat and not turn into something worse, cuz I really hate being sick. And I hope the boys don't get it. Jakey was coughing a little today so I hope that was just a fluke. I don't like to cook very much, though I do think I am a decent cook. I do pretty good and can make some tasty meals. But there is nothing like my mom's cooking. I guess it's the years of experience or something, but we can make the same dish with the same recipe and hers will always come out better. Like pork chops. When I cook them they are tough and taste ok, but not spectacular, I don't even like them. But when she makes them, mmmmm, they are soft and juicy and so good. I hope that as the years go on my cooking will get better too. "Learn to say "no." It will be of more use to you than to be able to read Latin." I don't know about you, but I have a hard time saying "no" to people. Like if I'm asked to bake cookies for some church thing and I have nothing to make them with, I will still say yes. Or if I'm totally busy and someone needs me to do something else that I don't have time for, it's hard to tell them I can't. But it is much less stressful if we learn to say no to things that we really don't want to do or can't do. A few months ago someone on a messageboard or blog I visit was talking about this toy they have that helps wear out their kids energy. I'm trying to remember what it was called. It had a mini trampoline that I think was triangular, and handles for the kids to hold on to. I bet something like that would be a huge hit with Jason, especially on days like today when it is too cold to go out and play. In just 2 weeks we move into our new house. Hubby is really excited because we will have our TV back. It's been at my brother's house while we've lived here, and they have enjoyed babysitting it for us. I'm just remembering all the work it was to get it mounted on the wall in our old house and not looking forward to that. I wish we had a plasma lift console instead, where you have a table thing that it can hide in and automatically lifts up at the push of a button. That would be awesome. Man, I am tired but I have the hardest time getting a nap. I laid down for an hour today and didn't sleep at all. I have a hard time falling asleep in the first place, then add in all the noise in this house and it's just impossible. I can sometimes get a nap with Jakey when the rest of the kids are at school and it's quiet, but on weekends there are too many people here. Another thing I hate about winter is not being able to exercise outside. After running that 5k last year I really want to just get out in the fresh air and run. It's not the same running on a treadmill in home gyms or gyms you have memberships to (neither of which I have anyway). I want to run a 5k, or maybe 10k, again someday, maybe next year. It just feels so nice to be out in the air running. I am so done with winter. The snow and cold are driving us all nuts and there is some serious cabin fever going on in this overcrowded house. I've been dreaming of Caribbean cruises, Hilton Head rentals, and camping for months but summer just doesn't come fast enough. Why oh why couldn't I have been born in a place that is summer year-round? I was not meant to last in this kind of weather lol. Just a few more minutes before I can finally wash my hair for good tonight and see how it turned out, besides the orange. I'm not going to post pics yet because we've still got some work to do on it. I'm starting to wish I'd just gone dark brown like I'd first planned. Blond is much more work. I'm one of those people that likes to keep coupons "just in case" I might some day decide to buy this item or shop at this store that I have never done before. Like all those Sunday ad coupons, I have 2 months worth of those and have only used maybe 2 coupons from them. I like to find online coupons too, like Overstock coupons or photo printing sites. I rarely actually shop online, but when I do decide to, I want to get the best deal. So today my sister spent about 4 hours dying my hair. I'm sitting here right now with enough foil on my head to pick up HBO. 20 minutes until I can rinse it out. I have so much hair, we weren't expecting it to take this long, but she had to do it in 3 separate sections. And for some odd reason, the sides went orange. Yeah, very attractive. She's going to get some toner tomorrow to try to fix it. I am tired and my back and rear end hurt from sitting on a folding chair for so long. This better be worth it lol. Have you ever played a practical joke on anyone? If so, what did you do and who was your victim? - You know, I have a bad memory. I have done practical jokes before, but I really can't remember on whom or what it was. I'll think on it some more, and add it later if I remember one. What do your salt and pepper shakers look like? - They are glass with little handles and white tops. Pretty ordinary. Where is the next place you plan to visit (on vacation or business)? - No plans right now, but we might go on a vacation this summer to one of Hubby's work's condos. What kind of lotion or cream do you use to keep your hands from getting too dry? - Renew by Melaleuca. It is wonderful. I have psoriasis and this helps it not get too bad. Make up a dessert, tell us its ingredients, and give it a name. For some reason today I could not remember if it was Wednesday or Thursday. I would convince myself it was one or the other, then remember something that would make it the other day. I'm fairly sure that it is actually Thursday today, so I have been told, my computer says so, and Friday's Feast is up. It really is hard to remember the days when you have no schedule or anything. The days just seem to run into each other. Tomorrow is Friday, that's good. I've always like Fridays. Buy.com is a great site where you can find great prices on all kinds of things, from appliances to computers to tools. They offer you comparison prices for whatever you are looking for so you can get the best price. A great thing they offer is a $10 coupon off any order of $10 or more, available to all new customers. How can you beat that? And they are the only E-tailer with a tier one celebrity doing commercials, they have none other than the great Howie Mandel. They also have Ryan Seacrest do a deal of the week. With such a great selection, comparison shopping, and many more reasons why buy.com rocks, you need to check out Buy.com. And check out my cute little video I made, I had tons of fun with it. Well, today has been kind of busy. This morning we went over to our new house again, this time to check out the gas hookup for the dryer. It wasn't in the listing so we were worried that we'd have to have one installed and it would have been a pain. But it turns out that they already have it. Then we went to Sears and Lowes to look at refrigerators. Found one we kind of liked but wanted to keep looking so we came home for a bit. My sister dyed my hair blond (we aren't all done yet) and cut it. While she was cutting I suddenly smelled fingernail polish really strong. Jason had decided to paint my mom's bedroom wall as well as himself with red fingernail polish. One of those moments were we had to laugh to keep from screaming and crying. He still has it stuck to his skin, and a big red spot on his head. A guy at RC Willey tonight asked if he fell and hit his head lol. It seriously looked like he had blood all over. My bro took a pic on his phone and I'm going to have him email it to me sometime. So this evening we went to Home Depot and RC Willey to look at fridges again. Home Depot had a very small pricey selection so we left there pretty quick. But the RC Willey Outlet Center has a huge clearance area and we found a really nice one for a great price just because it has a tiny dent and scratch on the bottom corner (we didn't even notice it until we actively looked over the whole thing), plus they threw in a 5 year warranty for no extra cost. Now we are just crossing our fingers that it will fit in our new house since the space is 36" wide and the fridge is about 35 7/8". We are planning to get a new dishwasher and range as well at one point to match, but that will have to wait. That's been our day so far. Now I need to eat something and get the boys ready for bed. They are exhausted cuz they hardly napped at all today. Name one thing that is unique about you. - Hm, I don't know. I have psoriasis, but that's not really unique. Fill in the blank: My favorite _________ is __________ but I like _________ too. - My favorite ice cream is vanilla, but I like cookies 'n cream too. What type of wood do you have for your home’s furnishings? - I have no idea lol. Who do you talk to most often on the phone? What level of responsibility do you have in your job? Mmm, I love Olive Garden! We ate until we couldn't take another bite. I normally hate mushrooms, but their stuffed mushrooms are delicious. I also got the minestrone soup and garlic-herb chicken con broccoli. It was all good and we've been groaning from over-full stomachs for two hours now lol, and we still have a ton of leftovers. Hubby also brought home a dozen white roses (my favorite) and 2 Symphony bars for me, he's so sweet! Now we just need to get the boys to sleep so we can go to bed too. I hope everyone had a wonderful Valentine's Day! Yesterday we had a big snow storm blow through. The roads were so crazy. We had to drive to our new house for the inspection, normally a 15-minute drive, and it took almost 45 minutes. Hubby was meeting us there and it should have only taken about 15 minutes from his work, and ended up taking him an hour and 15 minutes. Our realtor had to drive from Orem to here and it took her 2 hours instead of the normal 45 minutes. It was just crazy. The news said there were kids still stuck at schools and in buses at 7:30pm. But our house inspection went really good. There were just a few minor things that need fixed that they had already planned to take care of. I was happy that I still loved the house as much as the first time we saw it, and we are very excited for when we get to move in. We got to talk to the current owners for a while about the house and neighborhood and they were very nice. I can't wait to get moved in and make the house our own. Boy, these kids are on a roll today! Mess after mess after mess! They have way to much energy and I can't keep up with them. I think we are going to head to the mall play area so they can expend some energy then hopefully they will both nap. My mom is exhausted trying to keep up with them too lol. Silly kids. You know what really hurts? Jumping off a bed onto an upturned dog brush. Those hard prongs go straight into bare feet. Yeah. Pretty painful. I now have 5 puncture wounds on the bottom of my foot. I had to get some stuff out of a box in the boys room and had to climb on their bed to get it. Afterwards, I jumped off the bed without seeing what might be on the floor. Lots of pain. I lifted up my foot to see the brush embedded in it. I had to yank it out (ouch!) and hobble to my mom's room to see the damage and get it cleaned up. Now I can barely walk. I need to keep an eye on it to make sure it doesn't get infected cuz I'm sure the dog brush was not clean. So look before you leap everybody! Time for random stuff that people search for that brings them here. I love looking through mybloglog and seeing what crazy stuff people look for and get here. Sometimes they make no sense. So here are some recent searches to me. Finbar Oneill, pgpcollegeeducation.com, sweeney todd font, things that start with k, Emu Australia, about me myspace quiz, karl moore blog, getting glasses, "his teeth cleaned" or "her teeth cleaned" or "their teeth cleaned" (yes, that was one search lol), wireless landlord, and variations of all those. What is the weirdest search that has brought people to your blog recently? In previous years, we have never gone all out with party invitations and party favors and themes and all that with the boys' birthday parties, but this year I'm thinking we might actually do a themed party for Jason. He loves the movie Cars and I bet he'd be ecstatic to have a party with that theme. I wonder if I could make a cake that looks like Lightning McQueen? Hm, probably not lol, I might have to buy one. Good thing I still have 7 months to think about it. With the cost of prescription medicines so high for some people, a lot of people choose to use more "natural" remedies, including teas, herbs, and other alternative methods like accupuncture. There are tons of health food stores that sell stuff like grape seed extract, chamomile tea, and a bunch of stuff I couldn't name. Some people are pretty militant about whether Western medicine or Eastern medicine is better. I don't choose sides, I do my research and choose what I want to do from either side. We are watching Are You Smarter Than A 5th Grader right now. I've never watched it before so it's kind of fun. The guy's 2 questions away from 1 million dollars. It'll be interesting to see if I know the answers to the questions they ask. The last question was 'How many cups are in 5.5 gallons?' and we knew the answer, but I bet it's much harder to think of the answers, even if they are easy, under that much pressure. We were watching an episode of The Office the other day and in the episode they were having an awards ceremony and giving all the employees engraved plaques with random stuff on them. Like Pam got the "Whitest Sneakers" award or something lol. Reminds me of grade school when they had contests and didn't want anyone to feel like a loser so they would make everyone an award for trivial things, like "Smiles the most" or "Great hair". I need some peace and quiet. I am mentally tired from how noisy and active this house is at all times. I just want to check out condo hotels or something, where I can go and stay a few days just to calm my mind down. Years ago before I moved out I was used to all the activity, but now I'm not. I'm used to a much quieter life and being able to do what I want, when I want, with my own stuff. "There are some remedies worse than the disease." This is like me and cough medicine. Like those Chloraseptic sprays? I think I'd much rather just live with the cough instead of put that nasty stuff in my mouth lol. Any other thoughts on this little quote? There are so many health insurance options out there to help people with low incomes like medicare, chip, etc. Unfortunately even with those some people can't get help. I have a friend who have a very low income but don't qualify for government help with health insurance, and they can't get private insurance because no company will accept them because of past medical problems. So they are stuck paying hundreds and thousands of dollars for medical expenses, even though they can't afford it. Stuff like this makes me really wish there was some kind of healthcare reform here. In the last ten years the housing market in this area of Utah has just exploded. There are buildings and houses going up all over, and very quickly. They make tons of new subdivisions every year with names like Legacy Springs, Crystal Cove, Branson lots, and so on. When my family moved down here about 7 years ago there was hardly anything up where we lived, but now the whole area is chock full of houses, stores, fast food places, etc. It's just amazing how quickly they can get all this built, and yet they still take forever to fix the roads. It's funny how much difference rear spoilers can make on cars. For example, we have a Chevy Cavalier and it has a spoiler and whenever I see a Cavalier without one I think they look really weird. Of course there are some people that go way overboard with their spoilers. Like in the movie Cars, the car Wingo has a huge spoiler and it's just ridiculous. I think spoilers like that make no sense and don't look that good. Small spoilers are better. So how is everyone this weekend? Anyone have fun plans or anything? Nothing planned here, just staying home doing nothing like normal. And it's only 8:30am and I'm already bored :P I think we'll take a trip to Costco. We got a membership but have never been, so we want to check it out. And maybe we'll go to the mall and let the boys play in their play area again. I really tried hard to get a nap today, but it just wasn't happening. Every time I was almost asleep something or somebody woke me up. Grr. Plus my neck and back really hurt and I have a headache. At least the boys are behaving okay today. And my brother has been helping me with them. Tonight Hubby and I are going out with my brother and sister-in-law to dinner at T.G.I. Fridays. Yummy! That will be a lot of fun. I am thankful for the beautiful house we bought and that we get to move in a month. I am sooo excited! It really is wonderful. And I am thankful for my little sister who took Jakey when he woke up at midnight so I wouldn't have to get him back to sleep. I'm thankful I got a nap yesterday, and hopefully can get one today too. Do you know anything about Sea Pines rental? No? Well, me either. I'm just too tired to come up with anything remotely close to what it might mean. Is there an undersea forest you can rent? Yeah, that's probably not it. It's probably some vacation place on a warm beach, with a nice breeze wafting the smell of saltwater and sounds of laughter through the air. I bet people are swinging in hammocks, enjoying a cool drink, and mentally laughing at all us losers stuck in winter climates lol. I am so tired of being tired. I am just exhausted. That makes me grumpy, lose patience easily, and forget things. The boys keep waking up and ending up in bed with us, and I can't sleep with them there cuz Jakey moves around too much and wakes up to scream for his bottle and Jason snores really loud. I just can't take it anymore! We even put a gate up in their doorway to try to keep them in their room but they either push it over or climb over it. I really hope that when we move to our new house they will settle down and get back into normal routine of staying in their bed. Tonight I got to go out for a Relief Society social (church women's group). It was nice to get out of the house without the kids and just have adult conversation. We had dinner of lasagna and breadsticks and just talked for a few hours. It was a lot of fun. They had a bunch of food leftover so sent some home with me so we can have it for dinner tomorrow. I think I might take a shower and head to bed soon, try to get a bit more sleep than normal so I'm not so tired. My boys have been so crazy the last few days. Yesterday Jason painted Jakey's head with diaper rash cream. That stuff does not just wash out lol, so he walked around with grey hair all day. Then they dumped out a container of Lemon-Shine stuff (dishwasher stuff) all over the couches, carpet, and Jakey's head, of course. And again, that stuff doesn't just come out of hair when it's cemented in with diaper rash cream, so he had a gritty grey head. They repeatedly dumped out the contents of the game cupboard, they especially love the Risk pieces and Uno cards. Today they have just been on the go all day too, making messes and getting in trouble. Boy, I wish it was summer already so we could go outside and play to release some of there energy! So last weekend we went house hunting and looked at 10 houses. We immediately fell in love with #9 and put an offer on it that day. We anxiously waited the rest of the weekend to hear back. Monday evening we got the call- they accepted our offer! We are thrilled and so excited that in about a month we will have our own home again! And it is wonderful, so much room and just perfect. It's 2800 sq ft and 5 bedroom/4 bath. The kitchen is huge, I get a walk-in closet and great master bath. All the bedrooms are big, well every room in the whole house is big lol. I LOVE IT! Everything seemed to just fall into place for it, and from the minute we saw it I could imagine us living there. We close on March 7 and can move in 48hrs later. 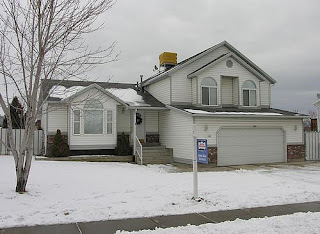 We also close on our old house in Idaho on March 3, so that should be a very fun week lol. I am just so excited about our new house and I can't wait to move in! We have been here three weeks already, wow! Hard to believe a little over a month ago we had no idea we'd be moving. It still hasn't quite sunk in that we live in Utah, I'll forget and think I'm in Idaho or think that I can't go see someone cuz they live far away in Utah or something like that lol. We still haven't gotten things like driver's license, checking accounts, cell phone numbers and stuff switched over to Utah stuff. Mostly we are waiting until we are in our new house so we only have to do the address change stuff once. Hubby and I are a bit subdued today after yesterday's Super Bowl. I just can't believe that after the Patriots perfect 18-0 season they lose the biggest game of the year. They really were not playing their best, the offensive line was letting people through to Brady on almost every play, he got sacked and knocked down a lot. And I don't know why they haven't been throwing to Randy Moss much the last few games, he's their best receiver and him and Brady are a good team, but they only threw to him 3-4 times that I saw. Overall the Giants played much better and deserved their Super Bowl win, but it's still depressing for us Patriots fans. Jason has been doing really good on potty training the last few days. Yesterday he didn't have any accidents at all and was in underwear all day. We even went to my brother's house for a few hours and he used their toilet just fine. The day before he only had 1-2 accidents. I'm really hoping he's finally getting it. I'm so happy :D It's really nice not to be using so many diapers. What is your favorite kind of cereal? - I don't have a favorite, I prefer to eat different ones all the time or I get tired of them. I like Fruit Loops, Marshmallow Mateys, Kix, Rice Krispies and lots more. When was the last time you purchased something for your home, what was it, and in which room did it go? - For Christmas Hubby got me (us) a mirrored hook thing for our entryway and shoe cabinet. What is the funniest commercial you’ve ever seen? - Um, yeah, way too hard lol. I've seen a lot of funny commercials but I really can't remember the funniest off the top of my head. Make up a name for a company by using a spice and an animal (example: Cinnamon Monkey). Fill in the blank: I haven’t ______ since ______.